Tell me more about Existem-am? 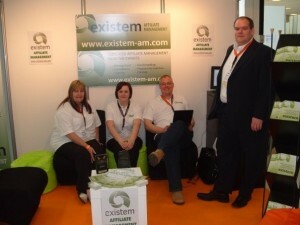 Existem Affiliate Management strives to maximise the success of merchants from affiliate marketing. We endeavor to provide honest and timely advice and transparent commercial relationships with our clients. We recognize when something works and will not seek to perform unnecessary work or changes on behalf of clients. We aim to provide quality services our clients require on schedule. Our wide experience in all aspects of affiliate marketing and treating all of our contacts as a valued client allows us to establish and maintain the key relationships between merchant, affiliate network and affiliate. What does it mean to be up for an award? Absolutely chuffed to be up for such a prestigious award, there are loads in the short list that deserve the award more than I do, I’m just thrilled to pieces to have received the nomination! If you think I deserve the award, then vote for me I guess?. I’m not really sure… I absolutely love the industry and love the job I do, hopefully that is conveyed in my work. I’d also love to have a nice shiny object on my desk! In all honesty it would be lovely to win and be recognised for my work by the people in the industry i respect, it means so much more coming from the affiliate community and I would be truly honored. As with most people it was all very random, I left uni with a degree in Geology and Science Communication, then needed a job and ended up selling advertising for mobile phone magazines, there was a natural progression into marketing for a mobile phone retailer and I was moved into the affiliate role. I spent some time there before making the big leap to join Mark and Bruce at Existem Affiliate Management, the best decision I ever made! Well, 18 months ago I didn’t even know what an affiliate was, let alone a feed or tracking. I learnt the industry from scratch with little advice so it was a tough year or so. I’d like to think that Mark and Bruce have nurtured me and refined some skills of mine! Phone me before 8am in the morning, I don’t like mornings at the best of times. They should stick to calling me at 2am, my brain workd better at night! There is massive growth to me made, I think the affiliate channel will be used more by merchants as the credit crunch continues, as it’s a fairly low cost channel. I think as long as all merchants are educated properly to the needs of affiliates and what they should and shouldn’t do with their campaigns the industry will grow exponentially! Ohh. This is a tough one, my Dad suffered with Leukeamia, so I would wipe that out. I’d maybe sort the finances of the UK out too, I’m sick of eating value food! I don’t do much actually, I know I probably should but I learned alot about various recycling and carbon efficent methods at uni, and they are not all as good as you think! Nothing, I’m really open! I guess not many people know I am a trained football ref? Teach yourself Italian – from about 3 years ago, I don’t use it. I’m on facebook and myspace too! You would hope my bosses Mark and Bruce would as I work my socks off for them and my clients, who would hopefully recommend me too! I try to make sure I cater for their needs and the needs of their affiliates to ensure a smooth running and successful affiliate programme! Argh, too many people to mention really, so many great people in theindustry. I would be here all day typing names. RT @swifty7: http://tinyurl.com/or8jxa it’s me innit!